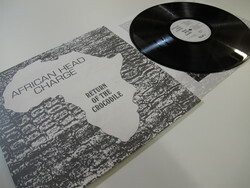 African Head Charge - Return Of The Crocodile. Vinyl LP. On-U Sound. Unreleased tracks and version excursions 1981 – 1986. 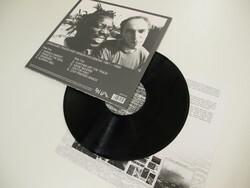 Inspired by Eno’s “vision of a psychedelic Africa”, English dub producer Adrian Sherwood and master Jamaican percussionist Bonjo Iyabinghi Noah collaborated on a series of studio experiments under the African Head Charge moniker, resulting in groundbreaking albums such as Environmental Studies and Off The Beaten Track. The otherworldly sounds they conjure up have touchstones in Count Ossie’s mystic revelations, Can’s ethnological forgery series and the post-punk underground, but ultimately inhabit a genre of their own creation. These radically different versions of early AHC classics and been lovingly restored and sequenced from the original master tapes by On-U archivist Patrick Dokter. Cut at dubplates & mastering in Berlin. Includes printed inner with sleevenotes by Steve Barker (On The Wire), plus download card for full album.